Before I begin, I want to express deep condolences on the tragic loss of life in the massive fire at Grenfell Tower in North Kensington. My heart goes out to the injured and all those who have lost loved ones. 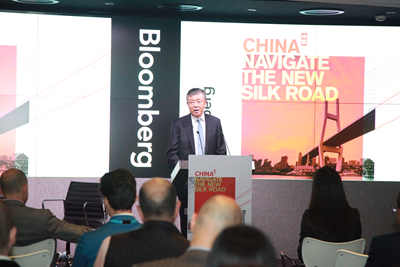 It is a real pleasure to join you for the Bloomberg's "China: Navigate the New Silk Road" Investor Roadshow in London. It is also good to know that this event has been held in major global financial centres over the past years. It has become one of the most well-known brands in the international financial community. There can be no better example than this to show Bloomberg's strength and influence in global business, financial information and services. These are very pertinent topics. They are the main themes of today's event as well as the focus of world attention. Let me go through them one by one. First, the Belt and Road. In mid May, the Belt and Road Forum for International Cooperation was successfully held in China. This international gathering brought together 29 heads of state and government, and 1,500 representatives from over 130 countries and 70 international organizations. The participants represent countries and regions around the world. President Xi Jinping delivered an important speech at the Forum, which was highly acclaimed by the participants. The Forum produced a long list of deliverables. They are divided into five categories, including 76 agreements and 270 specific outcomes. At the Forum, China signed 85 inter-governmental agreements with 69 countries and international organizations. A Joint Communique was adopted at the Leaders Roundtable. It sets out the objectives, principles and measures for the Belt and Road cooperation. And it sends out a message that all parties are working together to create a community of shared future for mankind. The Belt and Road Initiative signifies a new era. I believe there are at least four aspects that are key to understanding what this Initiative truly means to the region and to the world. First, the Belt and Road Initiative points out the way to peace and prosperity. The Belt and Road projects can only be built in a peaceful and stable environment. There are still uncertainties and instabilities around the world. Economic globalization is moving forward despite twists and turns. Problems such as governance conundrum, uneven development, digital divide, income disparity remain unsolved. Regional conflicts, terrorism and large-scale movement of refugees and migrants continue to pose daunting challenges. But lessons of history and practical experience tell us that in time of changes and challenges, we need more than ever to shore up confidence, stay focused and find the right way. The Belt and Road Initiative offers an answer and points to the way forward. This Initiative envisions a community of shared future for mankind. It focuses on the fundamental issue of development. It seeks to promote shared development and common progress by means of stronger connectivity of policy, infrastructure, trade, finance and people. It provides an answer and a solution to a series of acute problems the world is facing today. In this sense, the Belt and Road Initiative will not only promote economic integration and create opportunities in time of changes and challenges. More importantly, it will be our anchor and compass in safeguarding regional stability and world peace. Second, the Belt and Road Initiative is helping to shape open, global cooperation. Progress comes with openness. The Belt and Road Initiative aims to safeguard and promote open economy of the world. The vision of this Initiative is a massive growth belt unprecedented in span and coverage. It will link up the vibrant Asia-Pacific in the east with well-developed Europe in the west. It will encourage openness and stimulate growth. It will facilitate the orderly flow of production factors, enable efficient allocation of resources and lead to a higher degree of market integration. It will create new and effective demand and build up new value chains. Let me take financial connectivity as an example. So far, we have put in place an initial network of financial cooperation for this Initiative. and a stable and sustainable financial security system that keeps risks under control. At the Belt and Road Forum, China, together with British Government and governments of other countries, formulated the Guiding Principles on Financing the Development of the Belt and Road. This includes prospective suggestions on a bespoke financing system for the Belt and Road. And this paves the way for future cooperation. China will also join hands with the Asian Infrastructure Investment Bank, the New Development Bank, the World Bank, and many other multilateral development institutions to support projects under the Belt and Road Initiative. Third, the Belt and Road Initiative sets up a new stage for exchanges and innovation. Civilizations have become richer and more colorful thanks to exchanges and mutual learning. And the ancient Silk Road is the best example and the embodiment of exchanges and mutual learning between different civilizations. This is a valuable heritage passed onto us. Today, in the Belt and Road Initiative, exchanges and mutual learning are important contents. This Initiative aims to explore multi-level and wide-ranging cooperation in the field of culture and people-to-people exchange. It seeks to enhance ties in education, science and technology, culture, health, tourism, and sports. It is committed to strengthening mutual understanding, mutual respect and mutual trust between different countries. This Initiative believes in diversity and creativity. Everyone can be a partner, whether it is a country, an international organization, a multinational company, a financial institution or an NGO. At the Forum in Beijing, participants reached a number of agreements on innovation-driven development. They agreed to explore new models and platforms of investment and financing, and to improve financial services. They agreed to support innovation action plans for e-commerce, digital economy, smart city and hi-tech park. They agreed to protect IPR, to encourage experience-sharing on innovation and start-up models in the Internet age and to create new growth engines. Fourth, the Belt and Road Initiative demonstrates China's down-to-earth approach and sense of global responsibility. This Initiative is China's idea but China does not monopolize it. It is for the world to share. After four short years, this concept is turned into action. This vision has become reality. It is now a widely acclaimed global public good. China will contribute an additional 100 billion RMB to the Silk Road Fund. China encourages financial institutions to conduct overseas RMB fund business with an estimated amount of 300 billion. The China Development Bank and the Export-Import Bank of China will set up special lending schemes worth of 250 billion RMB and 130 billion RMB respectively. China will host the China International Import Expo starting from 2018. All these will provide strong support to the building of the Belt and Road. China is ready to share with other countries its development practice and the benefit of growth. But China has no intention to interfere in other countries' internal affairs. Nor does China want to export its own social system and model of development. The Belt and Road Initiative contains no military or geo-political, or geo-strategic intention. The objective is not regional dominance or sphere of influence for anyone but a family of harmonious co-existence for all. The Belt and Road Initiative is not meant to replace or to exclude. Rather, it aims to build on what is already there and help countries along the Belt and Road routes to align their development strategies for common development. Now, let me turn to the prospects of China's development. At present, China is the world's second largest economy, the biggest trading nation, the biggest destination for foreign investment and the second largest international investor. This means China has considerable influence on global trade and investment. With regard to the prospects of China's development -- I have three observations to share with you. First, the momentum of China's growth is robust. In recent years, China's economy has been steady and growing, with improved quality and efficiency. In the first quarter of this year, GDP growth was 6.9% . Import and export of the first five months grew by 26.5% and 14.8% respectively. A recent OECD report raised its estimate of China's growth forecast for this year and next year. Yesterday, IMF revised up China's growth to 6.7%. This is the second upward revision for China. The Belt and Road Initiative will have a highly significant role in many aspects of China's economy, such as supporting the economic transition and upgrading, creating new growth points and building new growth hubs to boost regional development. On the whole and in the long run, the fundamentals of China's economy remain positive. China will keep growing at a mid-to-high speed and steadily move up to become a mid-to-high income economy. My second observation: China's commitment to reform and opening-up is steadfast. China is advancing comprehensive deepening of reforms at home. We are working to streamline administration, delegate more powers to lower-level governments and improve regulation. We are working to improve government services. These are all reform measures adopted in order to transform government function. We are also working to reduce procedures subject to government review and approval. This will further lower the institutional cost for businesses. With regard to foreign investment, China is now adopting the negative list approach in its administration. This will make doing business in China much easier. For example, except in some very limited fields, foreign investors hoping to set up a company in China or make alteration to their companies do not need government approval. All they are required to do is to put this down on record. China will continue to work for an open and rule-based investment environment, build more high-standard pilot free trade zones, enhance IPR protection, and ensure fair competition. Going forward, China's door will only open wider to the world. 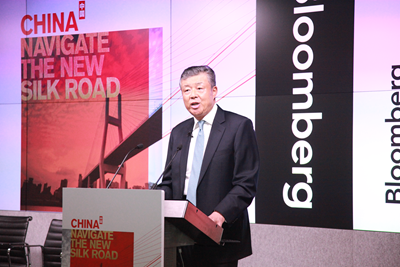 China will continue to be a prime destination for global investors. My third observation: China's growth has a strong stamina. China is the world's largest developing country. We have huge market potential, abundant human resources and increasing industrial capabilities. For foreign businesses, these mean broad prospects for investing and expanding businesses in China. They also mean a perfect platform for tripartite and multi-party cooperation. In the coming five years, China will import 8 trillion US dollars of goods, attract 600 billion dollars of foreign investment and make 750 billion dollars of investment overseas. These efforts will create huge market demand and abundant cooperation opportunities. Of course we are at the same time fully aware of the downward pressure and the real difficulties in China's economy. But as the Chinese idiom goes, "One flaw cannot obscure the splendor of the jade." The challenges China is facing are inevitable and typical in this stage of development. Considerable steps have been taken to address the challenges and these steps are taking effect. Now, let me talk about China-UK financial cooperation. This year marks the 45th anniversary of the Ambassadorial diplomatic relations between China and Britain. It is also a year for consolidating the "Golden Era" of China-UK relations. The past four and a half decades have witnessed steady progress in China-UK financial cooperation. This makes up a significant part of our win-win partnership, in which interests of our two countries are becoming increasingly intertwined. This financial cooperation has also been a key highlight of the "Golden Era" of our relations. Going forward, China-UK financial cooperation promises a great deal to be achieved if we can make good use of the policy bonuses, if we can leverage our respective strengths and if we can tap into our market potential. First, the financial departments of China and the UK have had multi-level and wide-ranging policy communication and dialogues in recent years. A broad consensus has been reached and a number of initiatives for win-win cooperation have been worked out. These bonuses need to be utilized to their full. There are some examples of how and where China and the UK have worked together effectively. The People's Bank of China and the Bank of England co-chaired the G20 Green Finance Study Group. The Eighth Economic and Financial Dialogue produced the China-UK Strategic Plan for Financial Services. China's Ministry of Finance issued the first RMB sovereign bond worth of three billion yuan in London last year. The Bank of China issued in Britain the first green covered bond. Our consensus and joint efforts will pave the way for upgrading our financial cooperation. As the next step, China and Britain can engage each other in closer exchange and cooperation in asset management, banking, capital market, insurance and pension. Other areas we have the strength to take the lead are green finance, fin-tech and financial inclusion. Second, China and the UK should match up our respective strengths and use them well in the Belt and Road building. The building of the Belt and Road requires not only investment and financing cooperation but also financial services. These include agent bank relations, syndicated loan, settlement and clearing. China is closely engaged with the countries along the routes and the relevant institutions in diverse forms of financial cooperation. The vision is to gradually help this region put in place a financial services network. The UK has rich experience in international finance. It is known for its mature management system. Britain also maintains close ties with many Belt and Road countries in the financial sector. In building the Belt and Road, the UK and China have every reason to join hands. The UK's strength, including experience, knowledge and creativity will find a good match with China's strength such as unique growth model, technology and marketing capability. As countries along the Belt and Road routes open their doors to innovative financial cooperation, this will unleash the potential for cooperation with China and Britain. This will definitely help London further consolidate its standing as a global financial centre. Third, China and the UK have enormous market potential and we should tap into it. China is further integrated with the global economic and financial system. This is marked by the IMF decision last October to include RMB into its SDR basket. China is also committed to providing greater access to its financial market, of which bond market opening-up is an important part. Recently, a bond connection scheme between China's mainland and Hong Kong was piloted. This created more channels for overseas investment. Here in Britain, the City of London as the world's leading financial centre has always played a key role in advancing the internationalization of the Chinese currency. 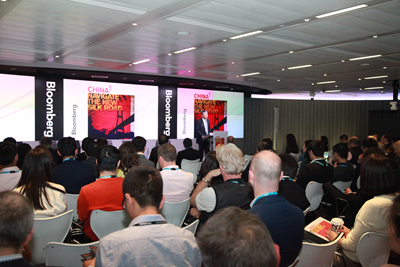 At present, London is the largest RMB offshore market outside China. As China's economy continues to grow, RMB will be used more frequently in cross-border trade and investment. This will be a big opportunity for both countries. So here is a major opportunity for London to become a global RMB offshore centre. And there are also opportunities born out of the market potential of both countries. These are opportunities for us to achieve win-win by diversifying financial products, expanding transaction volume, and increasing market connectivity. And a one-thousand-mile journey begins with the first step." What this quote emphasises is the importance of accumulation. And this applies to what we have been discussing. Business opportunities are limitless on our way ahead. They can be found in the Belt and Road Initiative, in China's economic growth and in China-UK financial cooperation. But what the future promises will not come true automatically. Therefore I call on you, business leaders from across the financial, asset management, legal and accounting sectors of China and Britain, to seize the opportunities, take concrete steps and work together for more win-win outcomes. In conclusion, I wish today's Investor Roadshow a complete success!